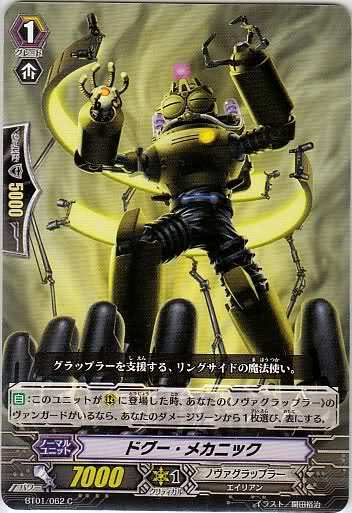 Nova Grappler is a very forward clan; the strongest cards tend to find the top spot and stick there. 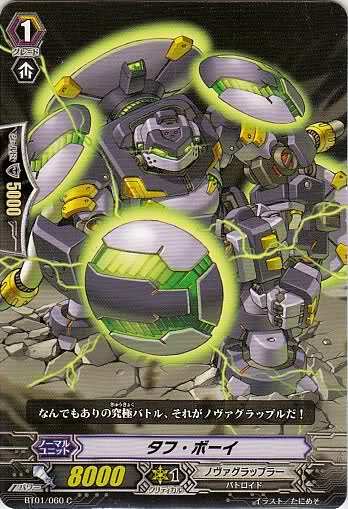 Genocide Jack is to this day their most reliable attacker, as even for a cost of counterblast 1, its autoskill will give it an automatic +5000 power while being boosted by a Nova Grappler, which is close to an immediate 20000-power vanguard. 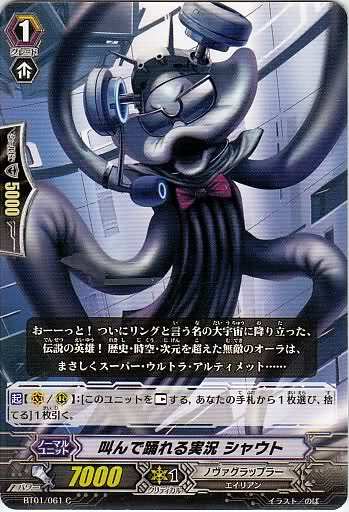 Since Jack can get by with as little as 5000 power supporting him in the vanguard circle, this gives the Grapplers a strong midgame and consequently a vastly greater amount of flexibility in which grade 1s they wish to include in a deck. 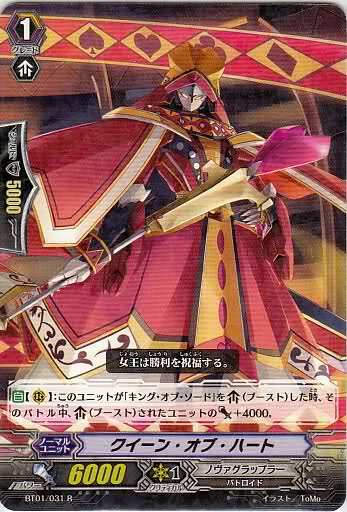 And speaking of those grade 1s, Queen of Heart is not a poor choice. When combined with King of Sword--the Grapplers' equivalent to Gallatin and Nehalem--she turns the King into a 20000-power rearguard of his own. Should this match fail the fighter, the Queen still finds utility by being a booster for Jack. As discussed in a previous article, just 8 grade 2s are needed to ride successfully each turn; the King himself is vastly superior to Gallatin for having the Queen to support him, so it would not be wrong to run x4 Genocide Jack and x4 King of Sword. Tough Boy is for now something of an orphaned unit. 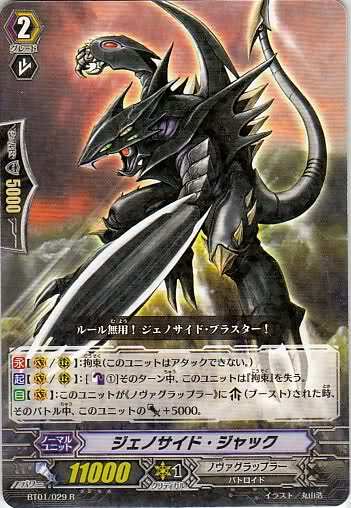 His 8000 power is too excessive to contribute effectively, since his slot in the deck is better offered to 7000- or 6000-power units with skills. 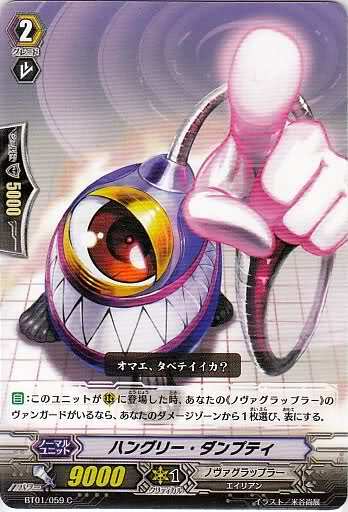 There is one exception found later on with Cup Bowler, which depending on the timing of the attack may have around 12000 power before boosting, and cards introduced further on in the Nova Grappler line do establish him as a consistent force for many decks. Shout's card change skill and Claydoll Mechanic's ability to unflip damage when called fills in the gap that Tough Boy left perfectly. 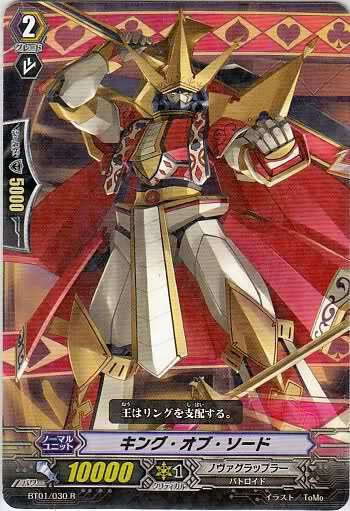 Both of them can bring Jack up to speed, but at the same time serve alternative purposes by allowing one to quickly search the deck for the cards in a combo, or otherwise reuse expensive skills. 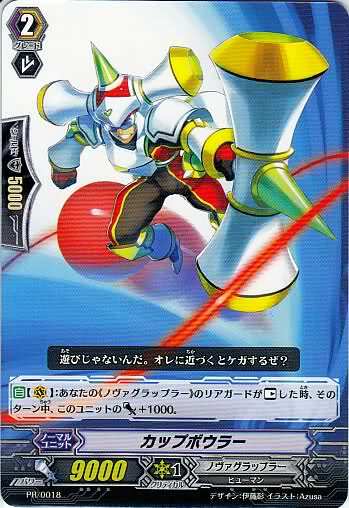 Specifically, Mechanic helps make use of Jack's counterblast, and it also works as an aid in mixed decks which splash in rearguards like Bors. Since these cards don't rely on vanguards of a specific clan, and their only associated cost is counterblast, the Mechanic heightens the deck's efficiency much as a real-world mechanic would tune a vehicle. Hungry Dumpty is also a mechanic, but at grade 2 rather than grade 1. This gives him the benefit of intercept, but introduces its own set of problems; any weighted presence from Dumpty in a deck would displace either Jack or King of Sword. At most, I would recommend running just 2 of him. Cup Bowler meanwhile, is such a great offensive rearguard that it was later souped up in grade 3 form in BT06. When one of your rearguards is rested, Bowler gains +1000 power; this includes attacking and boosting. Even without Tough Boy, attacking with Bowler as the third column in a lineup of six will easily let even a 4000-power rearguard push him past the 20000 absolute borderline. This qualifies Cup Bowler as a very great unit, being highly flexible and not really caring what you put behind him. Since he's a promo card, I would recommend swapping out those two Dumpties for two Bowlers.